BUENOS AIRES, Argentina -- They line up early every Saturday morning at the decrepit gymnasium that houses the La Matanza Barter Club. 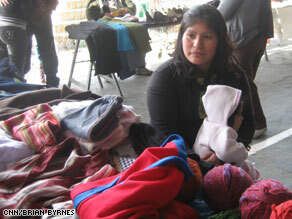 Nelly Vasquez and her 6-month-old daughter, Antonella trades wool for food. Club members shuffle in carrying sacks stuffed with everything from homemade clothing to homegrown vegetables, set up their stands and begin a day of bartering. The La Matanza Barter Club in the working-class Buenos Aires neighborhood of Isidro Casanova is one of more than 100 that now function throughout Argentina. They provide a vital service for people who are short on cash by helping them make ends meet. Each item brought to the club is given a value by its owner, who then trades it with other members for whatever goods they are offering. "What we do here is a fair and honest trading. I look at this like a job, and I work hard at it, and it helps me live better," says Deolindo Farias, 66, who brings fresh bananas and mandarins every week and trades them for household items like flour and sugar. Barters Clubs boomed in Argentina following the country's 2001 economic meltdown when jobs, security and cash were scarce. Club officials say during 2002 more than 2 million people participated in the clubs on a regular basis. "It's a reality now. In these past few months there has been a big increase. For example, we now have 400 people every Saturday. It used to only be 300. People are traveling here from other neighborhoods so they can barter too," says Juan Maccarone, president of the La Matanza Barter Club. Nelly Vasquez, 29, goes to the club because she has no other options. She lost her job at a clothing factory last year, and has been going to the barter club every week since January -- often with her six-month-old daughter, Antonella, in tow. "I come here because I don't have a job, and this is the only way for me to survive and get the things that I need," says Vasquez, who trades wool and women's shoes for pasta and rice. For others, the barter clubs offer something that every consumer on a budget seeks: a bargain. "If you go to the supermarket, they charge 10 or 15 pesos for a bottle of cooking oil. Here, I can get it with 50 or 80 club credits. That's only 4 or 5 pesos -- that's a big difference," says Maria Rosa Araya, 37. By all accounts, Argentina was the first Latin American country to have the barter clubs. The idea has now spread to other countries, like Uruguay, Colombia and Venezuela. There's even a burgeoning barter club circuit across the Atlantic Ocean in Spain. Organizers say barter clubs are evidence that in tough times, economies can thrive -- or survive -- on their own, when it's the people calling the shots. "The golden rule at barter clubs is to offer an honest product for an honest price," says Ruben Ravera, co-founder of Argentina's Red Global de Trueque (Global Barter Network). "It's a concept that could help solve the world's economic problems. Think about it," he says.